Mid-elevation Andean ecosystems have immense species richness and endemism. Taxonomic composition is known to change through time on the eastern slopes of the Andes as a result of climatic change and disturbance events, both natural and by human actions. Fossil phytoliths can capture local scale vegetation changes, especially among monocotyledonous plants. Phytolith production is high in grasses and palms, plant groups that are particularly sensitive to climatic changes and disturbance events in Andean ecosystems. Here, we reconstruct four centuries of local-scale vegetation change and the corresponding fire history from lake sediment records retrieved from Lagunas Cormorán and Chimerella, located at ca. 1,700 m a.s.l. in the mid-elevation Andean forests of eastern Ecuador. The charcoal analysis of the lake sediments showed no sign of past fires, and no evidence of cultivation was found at either lake. The phytolith assemblages indicated changes in the relative abundances of palms, grasses and trees over the last few centuries, suggesting that mid-elevation Andean phytolith assemblages are sensitive to local scale vegetation dynamics. The largest change in vegetation occurred at the end of the Little Ice Age, at which point the diversity of palm phytoliths decreases. 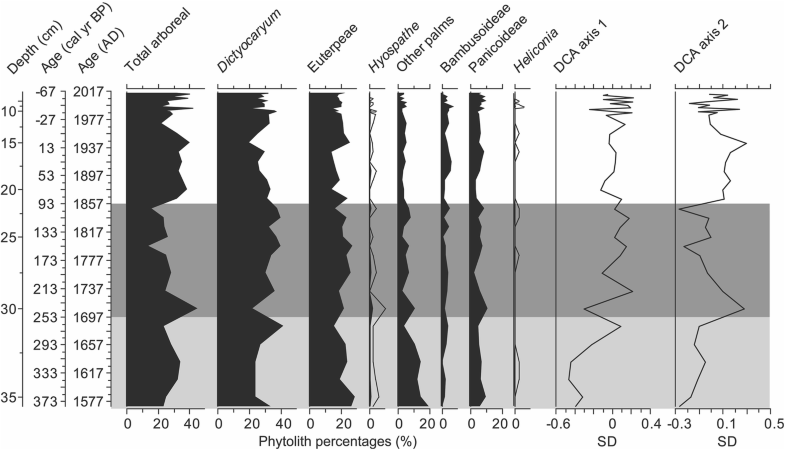 These phytolith assemblages are probably responding to changes in the cloud base position through time, which strongly influences the distributions of many plants and animals. Communicated by L. A. Newsom. The online version of this article ( https://doi.org/10.1007/s00334-019-00715-8) contains supplementary material, which is available to authorized users. The eastern slopes of the Andes mountains are one of the most diverse and yet most threatened regions on Earth (Myers et al. 2000). The steep elevational gradient provides habitats that range from lowland Amazonian rainforest to high elevation tropical grasslands. Per unit area, the mid-elevation forests at 1,500–1,750 m have a higher taxonomic diversity in many plant and animal clades than the upper montane forests above and the lowland rainforests below them (Terborgh 1977; Rahbek 1995; Killeen et al. 2007; Hughes 2016). It was long thought that these highly diverse tropical ecosystems had remained stable over geological timescales and that ecosystem stability led to the diversity that is now observed (Dobzhansky 1950; Baker 1970). Palaeoecological analyses, however, have indicated that these ecosystems were not stable through time, and are typically highly dynamic systems that are sensitive to long term climatic changes (Flenley 1979a, b, 1998; Rull 2015). Mid-elevation Andean forests are often immersed in clouds, which rise and fall with daily, seasonal and long-term changes in temperature (Tosi and Voertman 1964; Stadtmüller 1987). Many taxa have narrow altitudinal distributions and are dependent on regular cloud immersion (Svenning et al. 2009), so their response to climatic change is particularly strong (Bush 2002; Bush et al. 2011; Schiferl et al. 2017). These ecosystems are also dynamic on shorter timescales, and recent warming trends over the last few decades have resulted in Andean tree taxa migrating upwards at a rate of 2.5–3.5 m vertically per year (Feeley et al. 2011; Stocker 2014). In addition to climatic change and the variation of the cloud base height, Andean plant communities are affected by natural events such as landslides and human disturbances such as deforestation and agriculture (Brush 1976; Stern 1995; Feeley and Silman 2009, 2010; Bush et al. 2015). These factors, combined with biotic interactions, can limit the potential of Andean plants to migrate upwards or downwards in response to climatic change and movement of the cloud base (Clark 1998; Colwell et al. 2008; Hillyer and Silman 2010; Rehm and Feeley 2015; Oliveras et al. 2018). These migratory limitations threaten many mid-elevation Andean taxa with narrow ranges and probably increase extinction risks under further climate change (Feeley et al. 2011, 2012). The responses of Andean vegetation to past climatic change and disturbance events are typically reconstructed using pollen analysis. The pollen of many Andean plants, however, is wind dispersed and can travel many kilometres away from the source plant (Jackson and Lyford 1999; Bush 2002; Bush et al. 2011). Because of this long-distance dispersal, pollen reconstructions tend to reflect regional rather than local vegetation change. 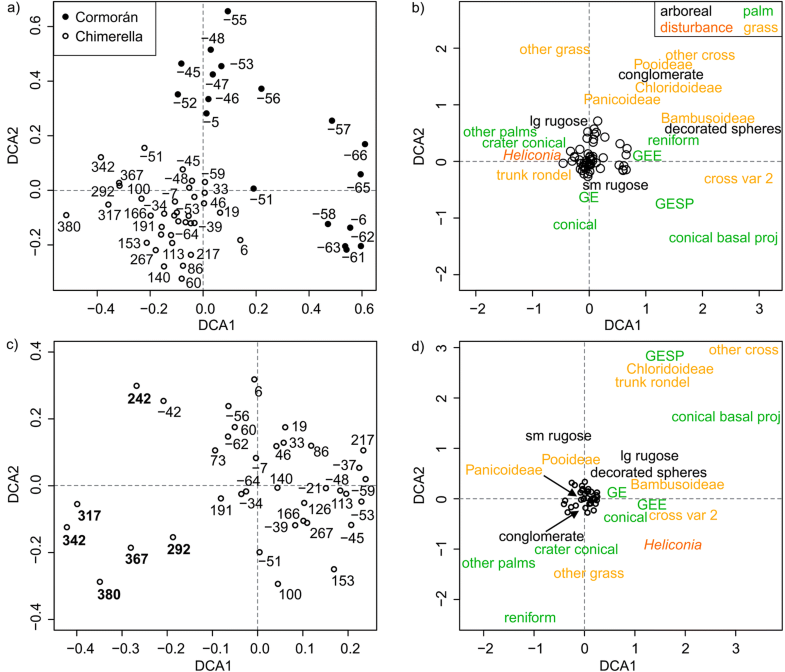 Phytoliths, by way of contrast, reflect a predominantly local deposition, and have the potential to reconstruct local instead of regional vegetation dynamics in Andean montane forests. Phytoliths are silica microfossils produced by many neotropical plants that can be preserved for millions of years in soils and lake sediments (Piperno 2006). Unlike pollen, they are deposited into soils close to the parent plant and, in non-fluvial settings, experience limited secondary dispersal. Most phytoliths are diagnostic to the sub-family level, with many being identifiable to genus. Many studies have demonstrated the usefulness of phytoliths in extracting information about grasses and understory plants, for example Heliconia, Arecaceae (palms), Cucurbitaceae (squashes) and Marantaceae (Piperno 2006; Morcote-Ríos et al. 2015, 2016; Pearsall 2015). 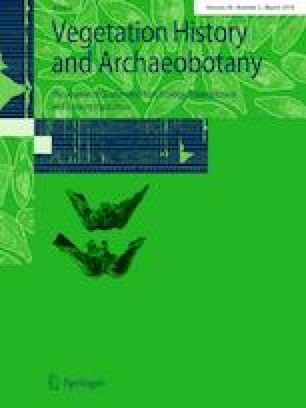 Many of these are also cultivated plants, thus reconstructions of past human activities can also be made using phytolith data. Understanding vegetation and ecosystem response to past climatic change and human influence in the hyper-diverse Andean forests is crucial to predicting how they would respond to future change. Local scale reconstructions of how these ecosystems have responded to past climatic changes, however, have rarely been attempted (Bush et al. 1990). Here we assess the diversity of phytoliths from mid-elevation Andean forests, and interpret the local vegetation dynamics and fire history of these cloud forests over the last 380 years by phytolith and charcoal analyses from lake sediments. Parque Nacional Sangay (Sangay National Park), in the Morona-Santiago province of Ecuador, covers 517,000 ha of the eastern Andes and spans an elevation range of 900–5,230 m (Fig. 1). The park consists of lower montane rainforest, mid-elevation cloud forest and páramo alpine tundra ecosystems. Sangay National Park receives ca. 3,875 mm of rainfall throughout the year, with a difference of only 132 mm between the driest and wettest months, recorded at 973 m. The average annual temperature varies between 20.4 and 21.8 °C at this elevation. A group of five lakes, Complejo Lacustre Sardinayacu, lies within the mid-elevation eastern montane forests of the national park, including Lagunas Cormorán and Chimerella (Fig. 1). Laguna Cormorán (2°04′00.60″S, 78°12′55.70″W; 1,750 m) spans 0.29 km2 in area, and has a maximum depth of 16 m. Its slopes are fairly steep, except for small marshy areas where a trail meets the lake, and the two water inlets on the south-east and north side of the lake. Laguna Chimerella (2°04′38.28″S, 78°12′13.79″W; 1,672 m) is approximately 0.30 km2 in area, and has a maximum water depth of 25 m. Steep, rugged slopes surround the lake (Fig. 2a) and evidence of small recent landslides was noted in two locations. These lakes were chosen because their elevation makes them particularly sensitive to upslope and downslope migration of taxa in relation to past climatic change. The lakes are also within a region of known archaeological sites (Rostain 2012; Fig. 1b), giving them the potential to record past human activities. The vegetation is dominated by the palm Dictyocaryum lamarckianum, visually estimated to comprise ca. 40% of the vegetation surrounding the lakes (Fig. 2b). Dictyocaryum species typically grow between 1,000 and 2,000 m, and are often found in patches of high abundance that are separated by long geographic ranges (Moraes et al. 1995). Bactris (0–1,700 m), Euterpe (0–2,000 m), Ceroxylon (1,000–3,000 m), Wettinia (500–2,000 m) and Geonoma (500–3,000 m) are additional Andean palm genera (Moraes et al. 1995; Henderson et al. 1997) that may occur at Cormorán and Chimerella. Because of the differential environmental tolerances of these palm genera, they are particularly useful for reconstructing responses to past climatic change. Lake sediment cores (6.7 cm diameter) were obtained from the deepest points of Cormorán (16 m deep) and Chimerella (25 m) using a Universal corer deployed from an anchored inflatable boat. The 18.5 cm long core from Cormorán consisted of loose top sediment and a more consolidated sediment structure in the bottom half of the core. At Chimerella, 36 cm of sediment was retrieved, consisting of loose top sediment (0–6 cm), a more solid texture from ca. 6 to 18 cm, and more clumped sediment with air bubbles towards the bottom of the core. Because there are so few data on mid-elevation Andean phytoliths, we collected these two short cores to determine whether phytoliths were preserved in these circumstances, and whether the diversity of phytoliths found would be useful in detecting past climatic changes. Bedrock or changes in lithology were not reached in either core. We have also collected longer cores from these lakes and are conducting pollen, phytolith and charcoal analyses that will be published at a future date. Both of the short cores consisted of organic-rich sediments, and no sedimentary laminations could be visually detected. Both cores were directly subsampled in the field at 0.5 cm intervals and all subsamples were sent to the University of Amsterdam Palaeoecology Laboratory for charcoal and phytolith processing. A chronology was constructed for the 36 cm core from Chimerella based on 14C radiocarbon dating of three bulk sediment samples at depths of 12, 27 and 35.5 cm. Samples were submitted to the National Ocean Sciences AMS facility at the Woods Hole Oceanographic Institution, Massachusetts, USA, and the DirectAMS Laboratory in Seattle, Washington, USA. The age model for Chimerella was constructed with the Clam 2.2 source code (Blaauw 2010) for RStudio (R Development Core Team 2013). All ages were calibrated using the calibration curve SHCal13 (Hogg et al. 2013) and post-bomb curve SH5 (Hua et al. 2013). For Cormorán, one bulk sediment sample from the bottom of the lake core was 14C dated. An age model was not constructed due to the modern date. For charcoal and phytolith analyses, volumes of 1 cm3 and 1.5 cm3 respectively were subsampled at 1 cm intervals from the Chimerella and Cormorán lake sediment cores. The charcoal samples were soaked in 3% hydrogen peroxide and boiled at 150 °C for ca. 15 min to enhance deflocculation. The material was wet sieved using a 160 µm mesh, and all remaining material was collected in petri dishes. Charcoal identification was performed using an Olympus SZH10 stereo microscope with magnifications of 7–70×. A total of 56,000 microspheres (Microparticles GmbH, Lot: SiO2-R-L3519-3, ∅ 15.29 µm, SD 0.49 µm) was added to each sample to calculate phytolith concentrations. The samples were then prepared by soaking in 33% hydrogen peroxide (H2O2), followed by 10% hydrochloric acid (HCl) and then potassium permanganate (KMnO4) to break down the organic material. Subsequently, bromoform (CHBr3, 2.3 SG) was added, followed by centrifuging for 75 s at 4,600 rpm to float the phytoliths so they could be extracted. Finally, the samples were mounted in Naphrax on microscope slides and heated on a hot plate to stabilize the material. All phytolith samples were analysed using a Leica Axiophot microscope with differential interference contrast (DIC) at 630 × magnification using immersion oil. A total of 250 phytoliths and the encountered number of microspheres were counted per slide. Phytolith identification and nomenclature is based on previously published literature (Piperno 2006; Morcote-Ríos et al. 2015, 2016). Phytoliths were photographed using a Fujifilm X-M1 camera. To analyse vegetation change through time, detrended correspondence analysis (DCA) was performed on the phytolith percentage data using the ‘vegan’ package 2.0–10 (Oksanen et al. 2013) in RStudio (R Development Core Team 2013). DCA was performed on the Chimerella record and a pooled DCA (DCAp) was performed on the phytolith assemblages of both lakes combined to assess phytolith richness and compare composition between the sites (Hill and Gauch 1980). A DCA was not performed on the Cormorán sediment record because of the purely modern sediments. C2 software was used to construct stratigraphic diagrams (Juggins 2003). The Chimerella lake sediments were stratigraphically consistent over the last ca. 380 years (Table 1; Fig. 3). Sediment deposition rates were highest during the modern period, ad 1950–2017 (Fig. 3). Sedimentation was higher from 150 to 0 cal year bp (ad 1800–1950) than from 380 to 150 cal year bp (ad 1570–1800) (Fig. 3). The basal date of Cormorán was modern (Table 1). No charcoal was found in any of the samples from either lake sediment core. In total, we identified six arboreal phytolith morphotypes, 12 palm morphotypes and 26 grass morphotypes, giving a total diversity of 44 morphotypes, and all of them were found at both lakes (ESM Figs. S1–S2). At Cormorán, phytolith concentrations ranged from 222,222 to 7,000,000 phytoliths per cm3, with an average of 968,666 phytoliths per cm3 (ESM Fig. S3). At Chimerella, concentrations ranged from 299,064 to 7,224,000 phytoliths per cm3, with an average of 1,062,923 per cm3 (ESM Fig. S3). Both lakes contained a concentration peak of ca. 7,000,000 phytoliths per cm3 at 14 cm depth (Figs. 4, 5). Though Chimerella and Cormorán both contained all 44 phytolith morphotypes, the relative abundances of those types differed within and between the lakes (Figs. 4, 5, ESM Figs. S1–S2). Small rugose spheres (< 15 µm in diameter) were the most common arboreal phytolith morphotype in both records, ranging from 10 to 40% (Figs. 4, 5). Large rugose spheres (> 15 µm in diameter), also indicative of arboreal taxa, ranged from 0 to 10% in both lake records. Decorated arboreal spheres ranged from 0 to 20% in the sediment records, and increased in abundance at Chimerella around 100 years ago (ad 1900). Conglomerate phytoliths, which also probably represent arboreal taxa, although they could potentially also represent palm taxa, ranged from 0 to 5% in both records, and were more common from 380 to 150 cal year bp (ad 1570–1800) at Chimerella (Figs. 4, 5). Conical palm phytoliths were the most common palm morphotype in both sediment records, and ranged from 10 to 40% of the phytolith assemblages (Figs. 4, 5). Their percentages had an opposite pattern of abundance and scarcity compared with forest phytoliths in the 380 year Chimerella record, but not at Cormorán. Globular echinate palm phytoliths, both the regular and elongated forms (sensu Morcote-Ríos et al. 2016), were present throughout both cores and relatively stable in their abundance (ca. 7%) (Figs. 4, 5). Both lakes also contained low percentages of globular echinate phytoliths with short projections and reniform phytoliths (sensu Morcote-Ríos et al. 2016), both of which represent palm taxa (Figs. 4, 5). The globular echinate with short projections morphotype had higher percentages from ad 1700 to present compared with earlier sections of the core from Chimerella (Fig. 5). Several previously undescribed morphotypes of palm phytoliths were grouped into a category of ‘other palms’ (ESM Figs. S1–S2). These phytoliths were highest in abundance from 380 to 150 cal year bp (ad 1570–1800) and decreased in abundance over the last 200 years (Fig. 5). Heliconia, a genus of flowering plants that is indicative of forest openings and has highly diagnostic phytoliths (Piperno 2006), was present in low abundances (0–0.8%) at both lakes (Figs. 4, 5). At Chimerella, this indicator of disturbance appeared six times throughout the core, while at Cormorán it appeared only in the uppermost sample (Figs. 4, 5). There was no overall trend in the presence of Heliconia in the Chimerella record (Fig. 5). At Cormorán, grass phytolith percentages ranged from 10 to 44% of the overall phytolith assemblage (Fig. 4), while at Chimerella, they ranged from 12 to 28%, with a relatively stable abundance between 380 and 140 cal year bp (ad 1570–1810) and more changes from 140 cal year bp (ad 1810) until the present (Fig. 5). These fluctuations were independent of changes in other phytolith morphotypes within the core. Grass phytoliths representing the Panicoideae sub-family ranged from 0 to 20% at Cormorán (Fig. 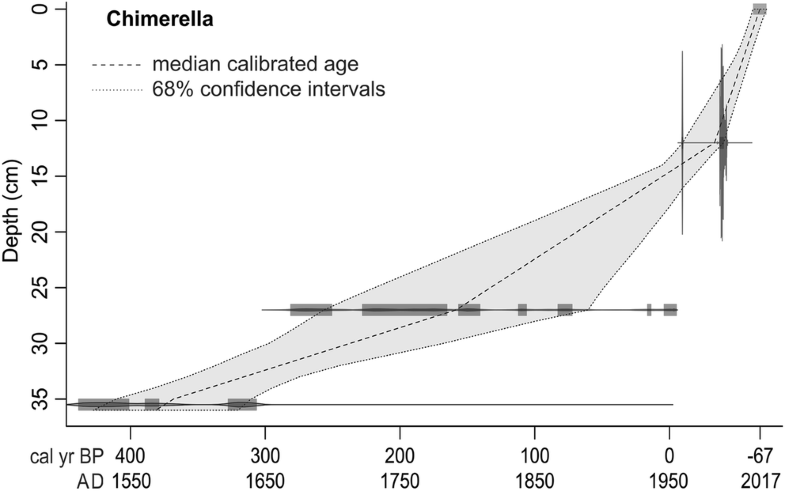 4) and from 3 to 15% at Chimerella (Fig. 5). There was no overall trend in these phytolith types at Chimerella (Fig. 5). Grass phytoliths representing the Bambusoideae sub-family were 4–18% at Cormorán (Fig. 4) and 1–9% at Chimerella (Fig. 5). The Bambusoideae phytoliths also showed no overall trend at Chimerella, although their abundance slightly increased over the last 60 years. Other grass phytoliths ranged from 5 to 19% in the Chimerella sediment record, and no evidence of Zea (maize) cultivation was found in either core. The pooled detrended correspondence analysis (DCAp) of the phytolith percentages from both lakes indicated a clear separation of assemblages between Chimerella and Cormorán on both Axis 1 and Axis 2 (Fig. 6a). The variation along DCAp Axis 1 was primarily driven by the higher abundances of almost all grass types in the Cormorán record compared with Chimerella (Fig. 6b). The variation along DCAp Axis 2 was driven by the higher abundances of conical palm phytoliths at Chimerella compared with Cormorán (Fig. 6b). Within each lake record, however, the opposite abundances and scarcities of ‘other palm’ phytoliths compared with decorated sphere phytoliths separated the samples along DCAp Axis 1 (Fig. 6b). In the Chimerella results, the ‘other palm’ phytoliths, which were highest in abundance from 380 to 200 cal year bp (ad 1570–1750) (Fig. 5), were the primary driver of DCA Axis 1 (Fig. 6c). The samples containing the highest abundances of ‘other palms’ corresponded with the most negative DCA Axis 1 scores, and samples with high abundances of conical, globular echinate elongate, and Bambusoideae phytoliths were primarily on the positive side of DCA Axis 1 (Fig. 6d). 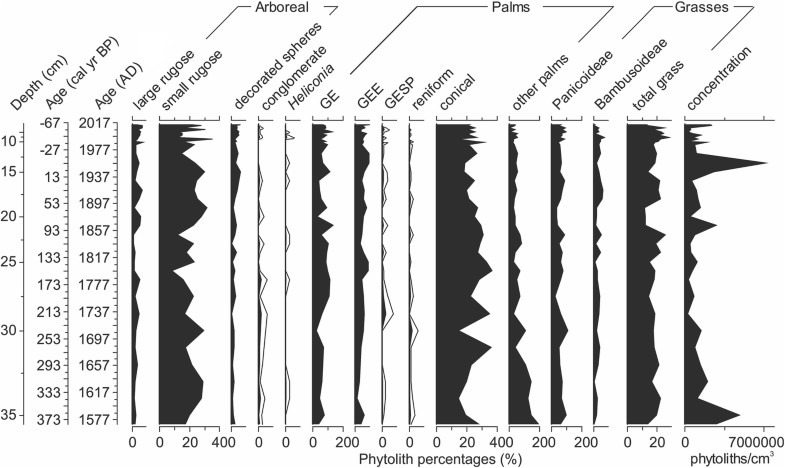 Samples with high abundances of ‘other palms’, reniform palms and Heliconia phytoliths were located on the negative side of DCA Axis 2, and samples with higher percentages of arboreal phytoliths, globular echinate with short projections palm phytoliths and Chloridoid grasses were located on the positive side of DCA Axis 2 (Fig. 6d). Dictyocaryum is an Andean palm genus containing three species with similar ecological requirements, all of which grow between 1,000 and 2,000 m under modern climatic regimes (Moraes et al. 1995; Henderson et al. 1997). Though its elevational range is quite restricted, Dictyocaryum is usually locally abundant where it occurs. Lagunas Chimerella and Cormorán are located at 1,672 and 1,750 m, and both had a remarkably high abundance of D. lamarckianum (ca. 40% of the total vegetation) growing in the watershed of the lake (Fig. 2). Dictyocaryum produces conical phytoliths (Morcote-Ríos et al. 2016), which were the most abundant phytolith morphotype found in the Chimerella record (Figs. 5, 7). The conical phytoliths probably representing Dictyocaryum were also abundant in the Cormorán record, though in similar percentages to grass and arboreal taxa. This is likely because of the marshy, grassy edges surrounding the lake margins of Cormorán, which were not present around Chimerella (Fig. 2a). The palm Euterpe precatoria is the most common tree in the Amazonian lowlands (ter Steege et al. 2013), and is the only species of Euterpe that can reach up to 2,000 m on the eastern slopes of the Andes (Moraes et al. 1995). The globular echinate phytoliths, particularly those with short projections, are associated with the genus Euterpe (Morcote-Ríos et al. 2016). Other palm genera also produce these types of phytoliths (Morcote-Ríos et al. 2016), but they are typically found in the lowland forests and do not reach 1,700 m. Thus we interpret this type of phytolith as representing E. precatoria (Fig. 7). It must be noted, however, that the phytoliths of many palm taxa are not yet described or catalogued, and so the globular echinate phytoliths may represent E. precatoria combined with other undescribed palms. Geonoma, Wettinia, Bactris, Hyospathe and Ceroxylon are also palm genera with species having ranges exceeding 1,500 m in the eastern Andes (Moraes et al. 1995). Geonoma typically produces conical phytoliths with acute basal projections (Morcote-Ríos et al. 2016), and this morphotype was rare to absent in the samples from Chimerella and Cormorán. 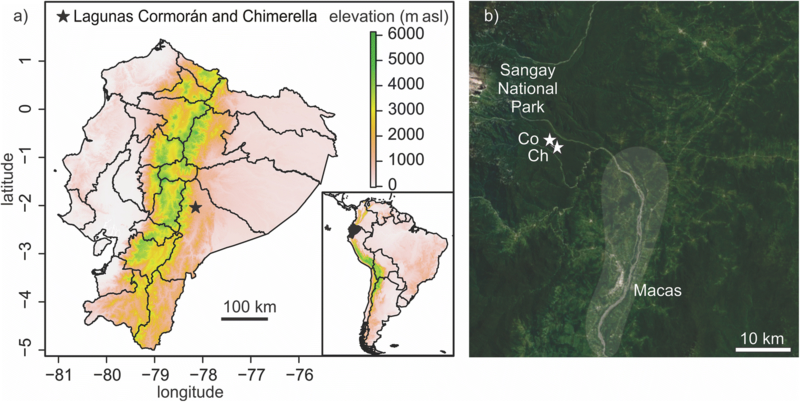 Wettinia castanea and W. cladospadix are known to occur between 1,200–2,000 m in the eastern Andes (Moraes et al. 1995). Bactris setulosa is also known to occur at elevations up to 1,700 m in the Ecuadorian Andes (Moraes et al. 1995). Wettinia and Bactris produce conical phytoliths, similar to Dictyocaryum (Morcote-Ríos et al. 2016). We interpret our conical phytoliths, however, as primarily representing Dictyocaryum because of its high abundance growing around the lakes (Fig. 2b). Another palm, Hyospathe macrorhachis is a narrow endemic occurring from 1,000 to 1,850 m on the eastern Andean slopes of Ecuador in the provinces Morono-Santiago and Pastaza, and H. elegans can also reach elevations of up to 2,000 m (Moraes et al. 1995; Henderson et al. 1997). Hyospathe was the only genus in our study site producing reniform echinate phytoliths and was directly interpretable in the records, though its abundances were low (0–4%) (Figs. 4, 5, 7). Ceroxylon is a palm genus that is not found in the lowlands and typically ranges from 1,000 to 3,000 m (Moraes et al. 1995). Phytoliths from Ceroxylon have not yet been studied. Ammandra decasperma and Phytelephas macrocarpa, two members of the Ceroxyloideae subfamily found in lowland settings, produce globular echinate phytoliths (Morcote-Ríos et al. 2016). Because various members within a subfamily or genus can produce different types of phytoliths, however, it cannot be directly assumed that Ceroxylon also produces globular echinate phytoliths. No charcoal was found in any of our samples, and we interpret these results as representing a true absence of fire over the four centuries, for several reasons. The area surrounding the lakes is uninhabited, and the park rangers informed us that there has not been a fire in the region since the establishment of the national park in 1975. These observational data correspond with the lack of charcoal fragments found in the Cormorán samples. The relatively steep slopes and lack of marshy vegetation surrounding both lakes would have increased the probability that charcoal resulting from fires, if any, within the watershed would have been deposited into the lakes. Because sediment cores from the wet regions of the Andes and Amazonia often contain charcoal (Loughlin et al. 2018; Montoya et al. 2018), we do not think taphonomic processes affected our results. The lack of fire combined with the absence of phytoliths from crops suggests that humans have not disturbed the area around Chimerella over the last four centuries. The modern town of Macas, which is located ca. 30 km to the southwest of Cormorán and Chimerella (Fig. 1b), was first established in ad 1538. Our data suggests that its sphere of influence did not extend to the areas of Cormorán and Chimerella during the time of early European colonization. The region around Macas was also occupied by pre-Columbian societies that constructed earthworks (Rostain 2012; Fig. 1b). It is unknown, however, whether those societies occupied the local areas around Lagunas Cormorán and Chimerella, though we will examine any evidence for potential occupation in the longer sediment cores that we have collected from the lakes. The largest assemblage change observed at Chimerella, as noted in the sharp increase in DCA Axis 1 scores, occurred ca. 310 cal year bp (ad 1640) when ‘other palms’ decreased in abundance and Dictyocaryum became more abundant in the landscape (Figs. 6, 7). Since that point in time, fluctuations in Dictyocaryum have signified the largest vegetation changes at Chimerella. DCA Axis 2 scores primarily reflect changes in the total arboreal (tree) coverage in the landscape, and reveal that these changes occur independently of changes in the palm assemblages (Fig. 7). Higher DCA Axis 2 scores correspond with higher amounts of arboreal phytoliths, and these periods sometimes, though not always, coincide with increases in disturbance indicators such as Heliconia and Bambusoid or Panicoid grasses (Figs. 6, 7). The sediment sequence from Chimerella reveals that Dictyocaryum has remained dominant and its abundance has remained relatively stable over the last 380 years (Fig. 7). This long-term dominance of Dictyocaryum was also observed at Laguna Palotoa, Peru, on timescales ranging from 3,700 cal year bp until the present (Schiferl et al. 2017). The direct comparison of Dictyocaryum between the two sites over the last 380 years, however, reveals contrasting patterns. The results from Palotoa show an increase in Dictyocaryum over the last 400 years (Schiferl et al. 2017) in contrast to the stability observed at Chimerella. Palotoa sits at a lower elevation (1,370 m) than Chimerella (1,672 m). These contrasting signatures suggest that the cloud base has remained relatively stable at elevations around 1,700 m, but that its lower boundary has fluctuated during the last 380 years. The patterns recorded at Palotoa and Chimerella probably result from natural ecological processes. Both sites lack any evidence of fire or agriculture, suggesting that the difference in the ecological dynamics was not driven by human activity. Disturbance events at Chimerella that have occurred over the last 380 years are identified by the presence of Heliconia phytoliths and increases of the grass sub-families Panicoideae and Bambusiodeae (Figs. 5, 7), all of which indicate tree canopy openings of various types (Piperno 2006). Mortality events from droughts, tree-falls or landslides probably caused these canopy opening events, which are common in areas with steep topography (Fig. 2a). In Andean vegetation, increased densities of Bambusoideae grasses, particularly of the Chusquea genus, are associated with landslides (Stern 1995). We observed evidence of past landslides on the slopes of Laguna Chimerella, strengthening the likelihood that dead trees or landslides created the ecological conditions resulting in the fluctuations in grass and Heliconia phytoliths observed in the sediment record. The landslides were probably small and similar to those noted in the modern landscape, because no changes in stratigraphy were observed in the Chimerella lake record. The overall trends in palms and arboreal taxa at Chimerella are independent of the changes in percentages of the disturbance indictors (Figs. 5, 7). This pattern suggests that the overall trends reflect either: 1, climatic change, 2, long-term successional changes resulting from disturbance events that happened prior to 380 cal year bp, or 3, a combination of the first two. The strongest climatic changes over the last 380 years included the transition out of the Little Ice Age (LIA). The LIA was a period of global cooling between 750 and 100 cal year bp (ad 1200–1850), with its most pronounced effects in northern Europe from ca. 400 to 200 cal year bp (ad 1550–1750) (Esper et al. 2002). The exact characteristics and timing of this event remain ambiguous among the studies in low latitude Andean forests to date (Polissar et al. 2006; Vimeux et al. 2009; Ledru et al. 2013; Schiferl et al. 2017). The start of the LIA falls outside the time captured in the Chimerella sediment record, which does, however, record the last half of the LIA until its ending at ca. 100 cal year bp (Fig. 7, grey shading). Climatic changes that occurred during the last half of the LIA are evident in the Chimerella sediment record. Previous work has suggested that a drier phase of the LIA occurred between ca. 250–100 cal year bp (ad 1700–1850) (Fig. 7, dark grey shading; Thompson et al. 1986; Liu et al. 2005; Ledru et al. 2013). The approximate timing of the start of the dryer phase corresponds with the largest changes in phytolith composition over the last 380 years at Chimerella (Fig. 7). The vegetation response to drier conditions may have included upslope migrations and a decline in abundances of taxa at the lower limit of their elevational distribution. Ceroxylon is most common at 2,000–3,000 m (Moraes et al. 1995; Henderson et al. 1997), and it is likely that the decline in ‘other palms’ is a potential indication of the upslope movement of Ceroxylon. The end of the LIA corresponds with a sharp increase in arboreal phytoliths at ca. 100 cal year bp (ad 1850), a further decrease in ‘other palms’ (probably Ceroxylon) and a sudden decline in grasses (Fig. 7). Towards the end of the LIA, the tree and grass communities at Chimerella were more dynamic, indicated by the radical shifts in DCA Axis 2 (Fig. 7). After the LIA, DCA Axes 1 and 2 stabilize and arboreal phytoliths remain at higher percentages than were observed for most of the LIA (Fig. 7). These data suggest that climatic transition periods resulted in the highest levels of flux, or dynamism, in Andean plant communities. Because areas around lakes can maintain local populations in microrefugia even when regional conditions are sub-optimal, the dynamism of Andean plant communities was probably stronger in non-lake settings than those observed in the Chimerella sediment record during climatic transitions. It is possible, however, that the changes seen in the palm communities over the last 380 years at Chimerella result from site abandonment following the 90% population decline of indigenous peoples that resulted from European arrival to the American continent (Dobyns 1966; Denevan 1992). Chimerella is located in an area that has pre-Columbian earthworks located ca. 10 km away (Rostain 2012). Previous palaeoecological reconstructions from lake sediments at similar elevations have suggested that the pre-European human impacts on the vegetation were stronger than modern human influence (Loughlin et al. 2018). Also, because trees in tropical ecosystems can live for several hundred years (Hartshorn 1978; Chambers et al. 1998), it is possible that these forests were actually in recovery from pre-European disturbances. A longer sediment record is needed to reveal whether this is the case, or whether the ecological dynamics observed over the last 380 years result purely from climatic changes. Mid-elevation Andean forests are some of Earth’s most diverse ecosystems, yet their ecological history remains understudied. We used phytoliths, which represent local scale vegetation, to reconstruct 380 years of vegetation dynamics in mid-elevation forests. Our study revealed a stable presence of Dictyocaryum, indicating that the vegetation system has been immersed in clouds over the last four centuries. No signs of fire or human activity were detected in either of the records, suggesting that the vegetation responded to climatic change or natural disturbances, including those from landslides or gap dynamics. The largest change in vegetation was associated with the last phase of the Little Ice Age. 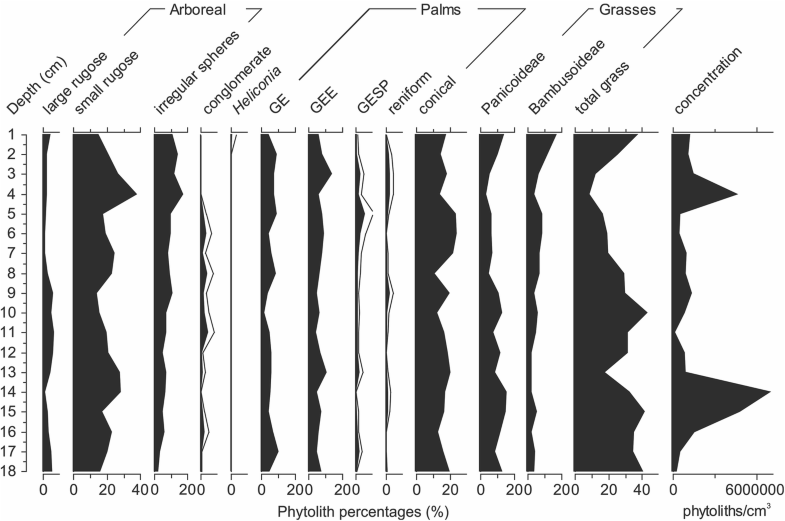 Our study demonstrated the potential of phytoliths to create more comprehensive palaeoecological reconstructions of local scale vegetation dynamics than previously possible. Treub-Maatschappij, the Society for the Advancement of Research in the Tropics, and Stichting Amsterdams Universiteitsfonds (the Amsterdam University Fund) provided fieldwork grants to S.H. Belmont Forum Grant ICER 1624207 provided funding for M.B. Fieldwork was conducted through the Minesterio del Ambiente in Macas, Ecuador (permit number 08-2017-IC-FLO-DNB/MA). We thank Bryan Valencia, Majoi Nascimento, Rachel Sales, Jorge Celi, Jairo Cabrera, John Lima and Carlos for their assistance in the field and Annemarie Philip for phytolith sample preparation.